Every year, 95 million families in America put up a Christmas tree. Deciding whether to go with the real thing or an artificial version involves lots of factors. Some people don't think it's really Christmas unless their living room has that "real tree" smell. Others would rather have Santa trap them in the chimney than spend the season sweeping up pine needles and crawling under the tree to refill the water. In other words, environmental considerations are probably low on most people's lists. In both cases, there are costs, according to the 2010 report. There's a common misconception about where real trees come from. 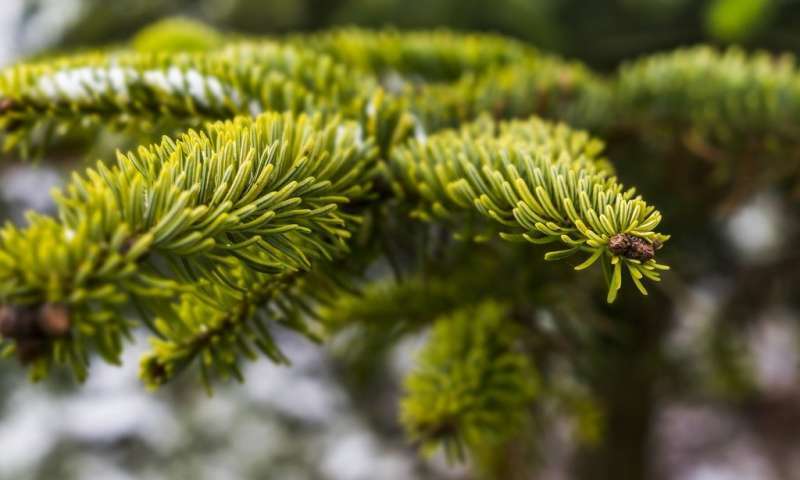 Lynn Wunderlich, who works with Christmas tree farmers in her role as farm advisor for the University of California Cooperative Extension, said many people assume the trees are cut down in forests and stolen from nature. In reality, Christmas trees are grown on farms in California, Oregon, Washington, Michigan, North Carolina, Tennessee and other states, and they are meant to be cut down. Christmas trees—including the Monterey pine, which is the most commonly grown variety in California—are a bit less water-intensive than fruit trees, Wunderlich said. Also, while the tree is growing, it's removing carbon dioxide from the air and turning it back into oxygen. To manufacture an artificial Christmas tree, you need PVC plastic, steel and aluminum, plus cardboard for the packaging and the resources to ship the trees from Asia, where most of them are made. The total amount of raw materials needed to manufacture an artificial Christmas tree is roughly equal to the amount needed to make an upholstered patio chair. What happens to the tree after the presents have been opened is another factor to consider. Some areas let residents compost real trees. Others incinerate them or send them to a landfill. Each option has its benefits and drawbacks. Artificial trees can be donated to places like Goodwill and nursing homes, but their ultimate destination is a landfill—they can't be recycled. So which one has the greater environmental impact? On a one-to-one basis, a real tree requires considerably fewer resources to create and get to the customer than an artificial tree, said William Paddock, the managing director of WAP Sustainability Consulting in Chattanooga, Tenn., who oversaw the peer-reviewed study. But if you plan to reuse your artificial tree, which most people do, the environmental impact eventually tips in favor of the artificial tree. "Over the course of time, there is a break-even point," Paddock said. "The question becomes, how many years does it take?" The most conservative estimates suggest it takes nine years of use for an artificial tree to be a better choice than buying a real tree every year. Paddock said six years is probably a more reasonable guess. There isn't data on how long the average person keeps an artificial tree before disposing of it, but "not a lot of people use it once and never again," he said. "My parents have the one we've had since I was 10 years old." The trade group's 2017 Christmas tree survey, conducted by Nielsen, found that 81 percent of Americans have artificial trees, and 19 percent go for the real thing. Either way, the environmental impact is not particularly significant in the grand scheme of things. "We believe there is no bad choice when it comes to a Christmas tree," said Jami Warner, the trade group's executive director. "Choose either tree, relax, enjoy the holidays."